Although in the early 1980s the complete closure of Calderstones, Brockhall and the Royal Albert may not have been official policy, the rundown in size of these institutions was increasingly part of the North West Regional Health Authority policy. Hand-in-hand with rundown was the need to develop more non-institutional based services. 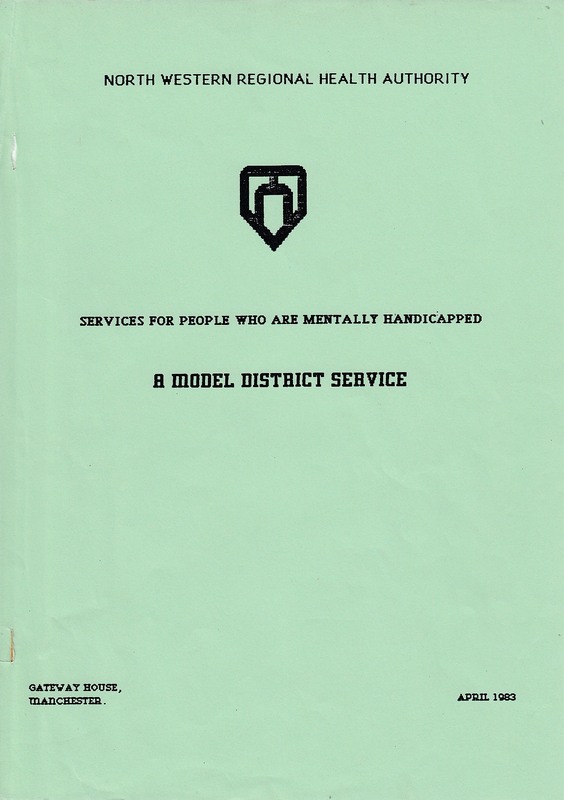 So in 1983 the North West Regional Health Authority produced a policy document called ‘A Model District Service’. This was authored by one of its advisory groups, chaired by Tom McLean, who was the senior manager at Calderstones. Based firmly on the principles of ‘Normalisation’, as advocated by Wolf Wolfensberger, ‘A Model District Service’ became a blueprint or – in the eyes of some – a ‘bible’ to guide the development of community based learning disability services in the north west. As ‘A Model District Service’ makes clear, for these community services to work for individuals with learning disabilities close co-operation between health and social services agencies was needed. Please click on the PDFs below if you want to read ‘A Model District Service’.